Windsor Hills, Orlando’s closest five star community to Walt Disney world, invites you stay in one of Orlando’s most sought after vacation rentals. This 6 bedroom Walt Disney World themed lakeside retreat is located on a serene street within the Windsor Hills community. While in our Orlando vacation home you will retain some of that same magical Disney World feeling you get while inside the theme parks. 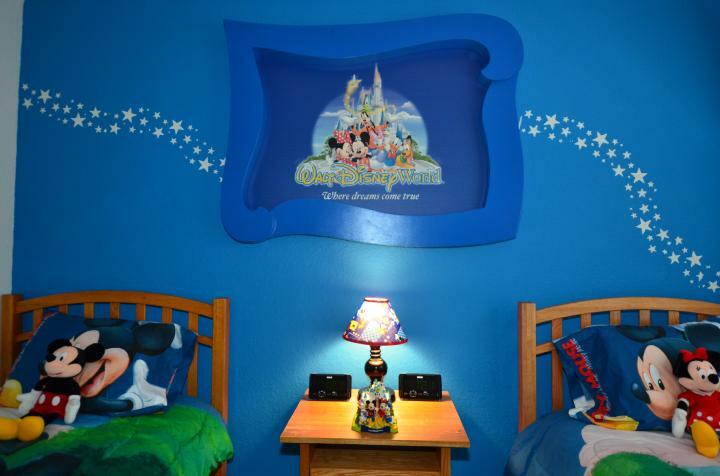 Our Disney World themed rooms along with rare, one of kind, theme park banners, signs and props that were once used inside the Disney parks are just the beginning. As you enter the vacation rental you will find the professionally decorated formal living and dining room with plenty of room to spread out in, almost 3000 sq. feet under air. Located just off the dining room is the family room complete with comfortable seating and a 46 inch HDTV LCD TV. The large eat in kitchen features a breakfast bar and nook with sliding doors that open to the lanai. Enjoy your culinary creations in this Orlando vacation rentals gorgeous formal dining area or sit at the kitchen table that overlooks your pool and the only lake in Windsor hills. The open floor plan of this home means there is space for everyone to enjoy a book in a quiet corner or enjoy a favorite movie from our extensive Disney Blu-Ray DVD library with the entire family. Our Windsor Hills Orlando Vacation Rental has an air conditioned game room complete with billiard table, air hockey and video game system on a second dedicated 46 inch HDTV LCD TV used solely for gaming for the kids (and adults) to enjoy! Our Orlando vacation home also features dual band wireless N and G high speed internet access if you need to stay connected while on vacation. Don't bother trying to pack enough clothes to last your whole vacation, pack light and use the home's full size washer & dryer. When it's time to retire after a day in the theme parks the adults will enjoy two delicately themed relaxing king sized Disney World master suites both with private bathrooms. Also located on this Orlando vacation rentals second floor you will discover the Disney Animal Kingdom and Disney Magic Kingdom themed children's bedrooms both with two twin sized beds. Just down the hall from these well appointed themed rooms you will find the king sized Disney Typhoon Lagoon bedroom with a king size bed. These three bedrooms share a full size Disney World themed bathroom. All six bedrooms, including the downstairs king sized Downtown Disney themed bedroom, all feature a pillow top mattress to ensure a restful night sleep, flat panel HDTV LCD TV's, Blu-Ray players, wall to wall carpeting, and dual auto configured alarm clocks (no walking into blinking 12:00). This vacation home is a short distance from the main entrance so you don't need to navigate a maze of streets like other Orlando vacation rentals. The location is also close enough to the Windsor Hills entertainment complex so that you can even keep an eye on your children from your lanai as they follow the sidewalk to it, they don't even need to cross the street! 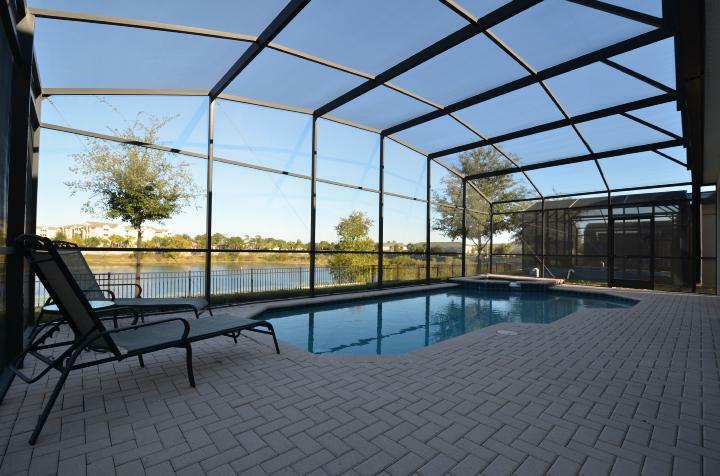 You can relax on the lanai and have a leisurely lake side breakfast soaking in the sun while the kids splash happily in the pool. After fun-filled days at the parks, you can tuck the kids into their own Disney bedroom and enjoy a private lake front dinner or relaxing dip in the spa. No need for the whole family to have "lights out" when the kids go to bed as you would in a hotel. Our Windsor Hills Orlando vacation rental is the place to be for your Orlando vacation, unparalleled in location, amenities and décor.